George Osborne's pre-election bribes budget apparently just did not live upto voter expectations as £3k bunged to first time buyers and £200 to basic rate savers amongst several smaller bribe was just not enough, either that or voters were spooked by the OBR bureaucrats savaging of the budget that implied a roller coaster ride of first severe austerity cuts of £65 billion per year, followed by a pre-election spending spree towards the end of the parliament. OBR: Implication of the Government’s spending policy assumptions is a sharp acceleration in the pace of implied real cuts to day - to - day spending on public services and administration in 2016 - 17 and 2017 - 18, followed by a sharp turnaround in 2019 - 20, as shown in Chart 1.3. As explained below, the implied cuts in 2016 - 17 and 2017 - 18 are a key reason why the Government is on course to achieve its new fiscal mandate to balance the cyclically adjusted current budget in 2017 - 18 with room to spare. George Osborne responded - “That is not actually the approach, as Conservatives, that we will take. We want to take a more balanced approach and we would not put all the cuts in government departments, as the OBR forecast shows. We would also make savings in the welfare budget and take additional action against tax avoidance, tax evasion, aggressive tax planning. So we would have a more balanced approach. So it looks like George Osborne blew it, as analysts have been busy number crunching the post budget opinion polls into seats per party forecasts that shows instead of a budget bounce, the Conservatives seats forecasts have actually fallen by approx 10 seats to Labour that puts both parties back virtually neck and neck. The following are individual forecaster trends with brief comments. 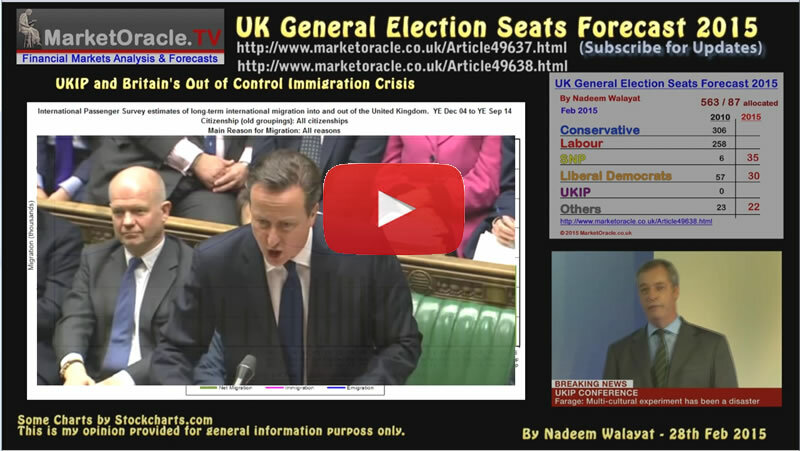 May2015 seats forecasts are starting to prove highly volatile. perhaps they need to dampen down their calculators settings a little. As of writing they are sitting on the fence by putting both parties virtually neck and neck. Are a strange bunch, consistently strong bias towards Labour and trending in the opposite direction of other seat forecasters. Most closely matches my forecast of 28th Feb 2015. Again another mainstream forecaster that is giving an edge to the Conservatives, though here the swing between major parties is a very tight marginal 4 seats, so not far from being sat on the fence. Whilst George Osborne managed to generate a lot of good headlines such as with the Help to Buy ISA. However failure to detail how he would cut public spending by approx £50 billion per year left the Tories open to brutal savaging by the OBR and IFS who grabbed the headlines for several days with warnings of a severe roller coaster ride cuts of £65 billion per year for several years, which is probably a true reflection of what actually would transpire should the Conservatives win an outright majority, as it is not rocket science to realise that governments want to get the pain out of the way during the first 2 or 3 years and then bribe the voters for the last 2 years before the election. So no budget bounce yet, but maybe when the OBR and IFS headlines subside the voters will forget about the prospects for severe austerity and instead focus on the bribes that they could personally capitalise upon, that and fears of an SNP-Labour catastrophe. The extremely tight election race means that minor, even inconsequential events and revelations are going to be blown all out of proportions such as todays story of an asian Tory Candidate ***** up attempts at trying to manipulate local Right wing EDL to put on a fake anti-mosque march so that he could come across as Gandi-esk peace maker amongst the electorate. Unfortunately for him, the EDL were plotting their own double cross to entrap and exposure him as illustrated by the mainstream press running with about 30 seconds of footage apparently taken from 27 hours of covert footage. the net effect is that his political career is already over even before it had started and the Tories have egg on their face for a couple of days, leaving the EDL as winners for having out witted an asian Conservative parliamentary candidate. If the current trend continues then an even tighter hung parliament than 2010 is possible, which is contrary to my view that the Conservatives could win an outright majority on May 7th as per my long standing analysis of seats vs house prices trend trajectory that painted a picture for a likely probable Conservative general election victory. Therefore in my opinion the opinion polls continue to portray an inaccurate picture as probability continues to favour the Tories over Labour to the extent that they could even win the May election. The updated election seats trend graph illustrates that the Conservatives are virtually ON TRACK to achieve the forecast outcome for an outright election victory on a majority of about 30 seats which NO ONE, and I mean no serious commentators / analysts has or is currently advocating.